A Lebanese twist to tomato sauce with gentle spices and almonds; a lovely variation on a theme. 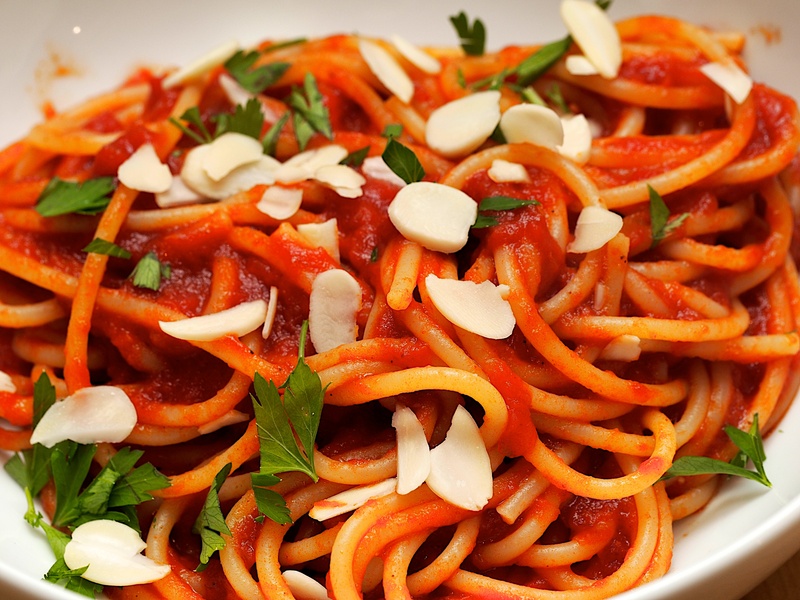 The proportion of sauce to spaghetti is also very different to how the Italian’s make pasta so there is a lot of sauce for this dish. This worked for us but you could use the same amount of sauce for a greater quantity of pasta and therefore serve more people if you’d like. The spices are subtle and warming and the pinches can be generous if you like. Put the tomatoes, tomato purée, garlic and sugar into a pan and simmer over a low heat. Stir frequently and simmer for 30 minutes. Stir in the olive oil, cinnamon, allspice, nutmeg, salt and pepper and cook for a further 20 minutes. Meanwhile bring a large pot of salted water to a boil, add the spaghetti and cook according to packet instructions (usually between 10-12 minutes). Reserve 3 tablespoons of the cooking water and then drain the cooked spaghetti. Return the spaghetti to the cooking pot with the reserved cooking water and the tomato sauce. Toss well and then serve sprinkled with the almonds and parsley. Wine Suggestion: we drank a Valpolicella Ripasso with this dish and the ripe, juicy spices went well with the warming spices of the sauce.